PhotoshopCandy is happy to announce another Corporate Logo Design contest. During this time the client will be able to see all submissions and will decide upon a winner. Client will have 7 days to choose a winner after this period. COMPANY DESCRIPTION: Website Programming, website design, SEO and digital marketng company. (Paypal payments preferably) If you do not have a paypal acct or cannot accept money through pay pal than other payment methods can be worked out upon request. Colors: NO PASTELLES – and NO feminine color. i.e.,pink, purple etc. Overall feeling: Corporate but not boring. Logo Usage: Client will be using the logo on Business Cards, Website, letterheads, invoices, & other marketing material. INSTRUCTIONS FOR SUBMITTING – PLEASE READ! 1. Work File : Vector files (.ai or .eps) or your high res. (300 dpi + CMYK) Psd file with layers intact. All work must be original artwork of the designer. If the logo was created in photoshop, it must be done in a way that the logo can be scalable (resizable) without losing quality. Not sending the proper information and/or files may result in disqualification of submission. Client can extend the contest deadline at any given time – it will be posted on site if so. The client will be granted the full rights to all aspects of the submission of their choice as a work-for-hire in exchange for the prize mentioned above. Want to start your own design contest? Contact us for details. in short there are two types of graphics – bitmap or vector. 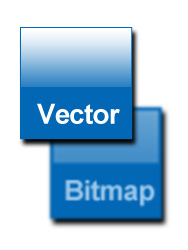 Bitmap is made up of dots and vector is made up of mathematical calculations which form shapes. Are you lost? Well, I am not going to go into so much detail but the main idea I want to get across is the practical quality difference is found when scaling the graphic. Since when you scaleÂ graphic object made of dots, the computer has to guess how to re-place all those dots over a larger or smaller area of the screen and when doing so it messes up slightly and usually comes out blotchy. But when creating a vector graphic, the computer just re-uses that same mathematical calculation system to create the same shape exactly but in a different size. Vector graphics are generally used for print. To retain the sharp crisp quality and re-sizing abilities. Photoshop is not a vector program – When youÂ create a shape using the shape tool or design a custom shape with the pen tool . You shouldmake sure not to rasterize it. Rasterizing it will flatten it out to a bitmap graphic. If you keep it as is..it will remain just like a vector graphic. Adobe illustrator is a vector program and logos should generally be done in this program as opposed to photoshop. If you love photoshop and dont know illustrator…you should know..ITS EASY and its very similar and worth it for all those print projects and logo projects. Congrats to Jennifer Cressy! Winner of the Inspire Events logo contest. CONTEST HAS ENDED. We hope to announce a winner in the coming days! PRIZE: $100(Paypal payments preferably) If you do not have a paypal acct or cannot accept money through pay pal than other payment methods can be worked out upon request. Logo Usage: Client will be using the logo for Menus, Apparel, and Wesbite. We would like the logo to be easily recognizable when seen.